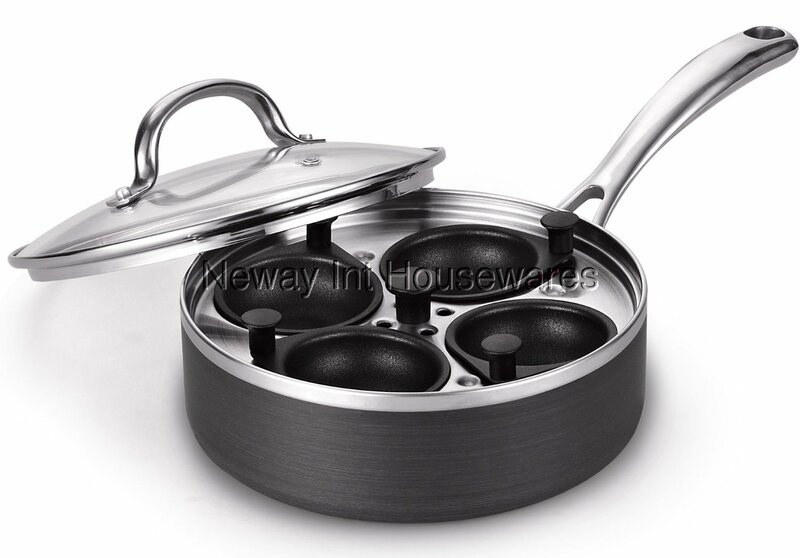 The Cooks Standard 4 Cup Nonstick Hard Anodized Egg Poacher with Glass Lid, 8-Inch has an anodized surface that is durable and heats evenly. Nonstick makes food release and cleaning easy. 4 cups are made of hard anodized aluminum and hold 60 ml each. Tempered glass lid with steam vent make viewing food easy from start to finish. Stainless steel handle is riveted for strength. To use: fill pan with water, put eggs in cups, and cook to desired firmness. Works on: gas, electric, glass, halogen, ceramic, etc. Oven safe to 350F, Not Induction compatible. Dishwasher safe. Works on: gas, electric, glass, halogen, ceramic, etc.